As we begin to consider downsized-living, we should know that today’s smaller homes come with new interior features and multi-purpose rooms that serve more than just one function. These homes now consist of more open interior spaces, fewer corridors (that led to one room or other) and doors, wider windows and cross-ventilation, and lower ceilings, a deviation from the past where separate rooms served different purposes - living room, dining room, kitchen, etc... were all individual rooms. 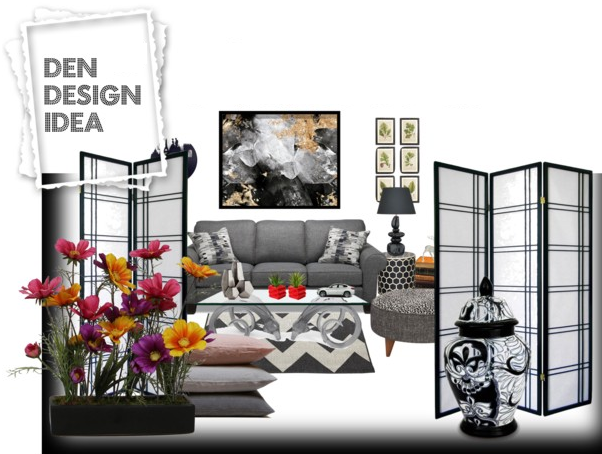 This is an example of space division using a pair folding screen panels and other home decor items to partition the cosy family room (den) from another space within the room. First, let me explain what a multi-purpose room is. It is a room or interior space that serves more than one purpose or function. Having open spaces like this ensures you make the most of your room's square footage. A space that possesses segmented areas within itself (living, dining and kitchen areas) without any of these rooms built as separate entities, is a multi-purpose/multi-function room. Utility room - garage (2 functions served in one space. But how can you effectively divide one area (or zone) from the others in a stylish yet functional way? How do you divide the zones of each room and make each zone private on its own? Different zones can be created decoratively, not with brick, dry walls, or wood panelling, but with features and forms that will add style, purpose, and aesthetics to the entire room. There are many ways to achieve this, and if you plan to add some form of partition as a space divider, you will find the following ideas not only attractive and easy to implement, but quite affordable too. 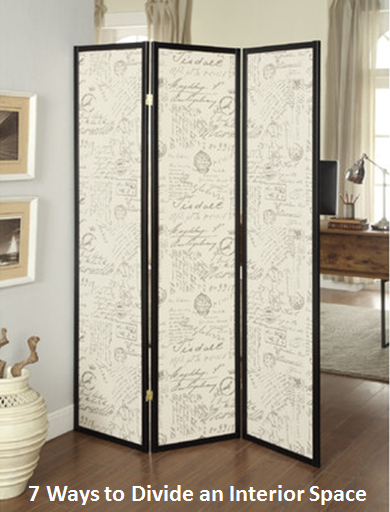 Folding screen dividers are trending once again and are a more traditional style of a space divider. They are great for partitioning off areas within a room and can be expanded or folded closely, depending on what you desire to partition off. Many folding screens are Asian inspired and come in two, three, or four panels (depends on your boundary line). A line-up or cluster of tall plants can serve as a space divider. You can use either artificial or natural foliage as long as they are not less than 140cm height. Remember the arrangement is meant to serve as a 'partition' or divider so arrange them like a plant wall'. Line them up in groups of threes or fives. 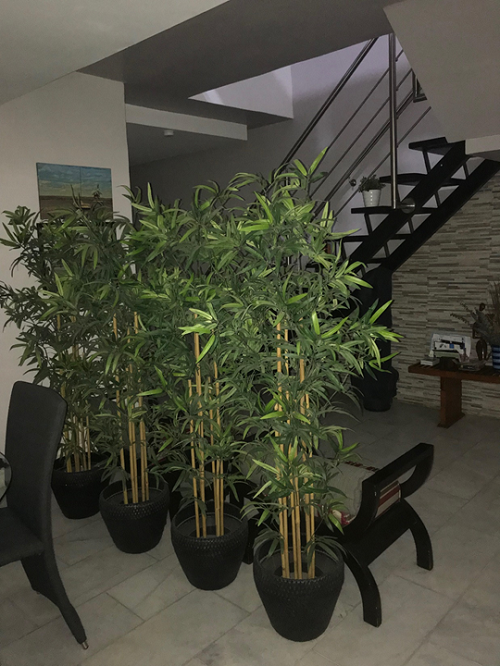 Natural or silk bamboo plants work well because they are tidy, can be arranged in a uniform manner (if you wish), and their leaves are not all-over-the-place. Ensure you use modern style pots or basket weave planters as long as your choice enhances the room's décor. Potted faux bamboo plants act a space divider, partitioning the dining area from the walkway. Once you've determined the boundary between your living area and dining area, for instance, divide the two areas with an open shelf /bookcase unit where you can display anything from your choice books and magazines to objects of art and family memorabilia. 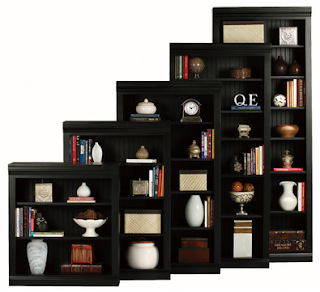 The shelves and uprights may be configured symmetrically or asymmetrically. Such units serve as a 'visual’ room divider (partition) where you can see through but can't pass through. Remember to leave ample space for movement from one zone to the next. 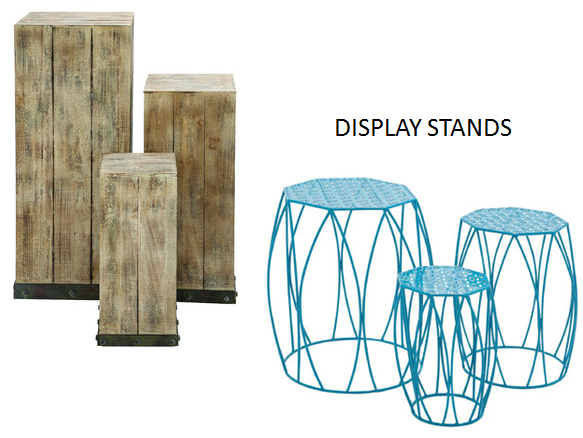 Display stands or blocks (rectangular, square, or cylindrical) of varying heights can be arranged in a line or cluster to serve as a room divider that demarcates areas within a multi-functional room. Display items you can place on each include artworks (carvings, ceramic statues, metal art, etc…) flowers or dried plant in unique vases, driftwood, your trophies, and the like. Depending on the available space, it can be a line-up of 3, 5, or 7 units. Using odd numbers is best. Bring nature into the interior space (asides plants) and use as a room partition of sorts. 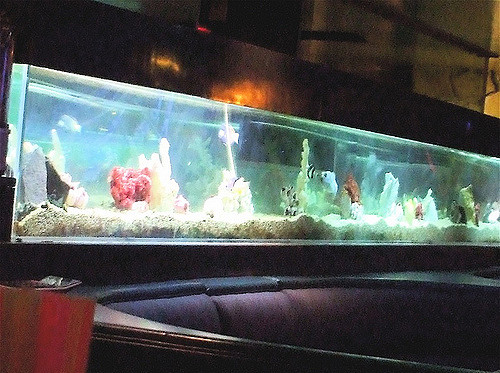 Custom built aquariums make one of the best space dividers because your guests will never tire of watching swimming fish and listening to the gentle sounds of moving water. But if you dislike the idea of having to maintain a fish tank, you can have an ‘aqua-scape’ with water (an underwater garden without fish), or without water (a glass tank with plants, beach sand/seashells, rock-work and/or driftwood) instead. It won't require much attention except for the occasional dusting regimen. A custom-built storage cabinet will not only serve as a partition of sorts, it will also be a smart, functional, and versatile item of furniture. This is another great idea for a room divider . . . with a two-faced multi-functional cabinet. It can serve as a library of books on one face, and a storage section with doors on the other face. Use the top surface as you would a mantelpiece. It should be deep enough (minimum 45cm) to serve both functions comfortably. 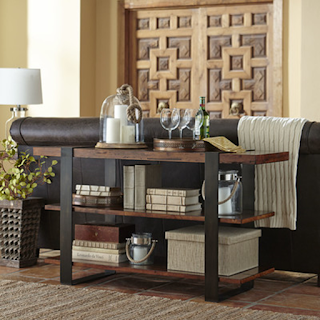 Console tables do not always have to be placed against a wall. They can be used as a floating freestanding room divider to separate areas in a creative fashion as well. Depending on the invisible boundary line you’ve drawn between spaces, you can use a short or a long console to act as a room divider. Ensure it’s a bit tall (min 100cm and max 120cm) and display nice decorative items like framed family photos on pretty stands, objet d’art, or souvenirs. And finally, if you just want something simple but striking, another great room partition idea is to use wooden slats or even luxurious beaded curtains. The former are Japanese inspired and both types are quite easy to install. Wooden slats and beaded curtains can perfectly and stylishly separate areas while appearing light and airy.